Our most popular shaker/water-bottle hybrid is now available in durable, odor-resistant stainless steel. With a design that's as elegant as it is rugged, the single-wall stainless-steel SportMixer® is perfect for the gym, the outdoors, or on the go. PREMIUM 18/8 STAINLESS STEEL Our most popular shaker/water-bottle hybrid is now available in durable, odor-resistant stainless steel. With a design that's as elegant as it is rugged, the single-wall stainless-steel SportMixer® is perfect for the gym, the outdoors, or on the go. SMOOTH TASTES GOOD Say 'goodbye' to lumpy protein shakes and 'hello' to smooth, great-tasting drinks. Our patented mixing system uses the BlenderBall® wire whisk—found only in BlenderBottle® brand shaker cups—to mix even the thickest ingredients as you shake. CLIP IT, LOOP IT, HANG IT The SportLoop™ is surprisingly handy—you’ll wonder how you ever went without it. LEAK PROOF GUARANTEE Tighten the SportMixer®’s screw-on lid, snap the flip cap shut, and you’re ready to roll. WORRY FREE Made from only the highest-quality materials, BlenderBottle® brand shaker cups are—and always have been—BPA and Phthalate free. STAIN & ODOR RESISTANT Made of premium 18/8 stainless steel, the SportMixer® lets you enjoy today's smoothie without tasting last week's protein shake. 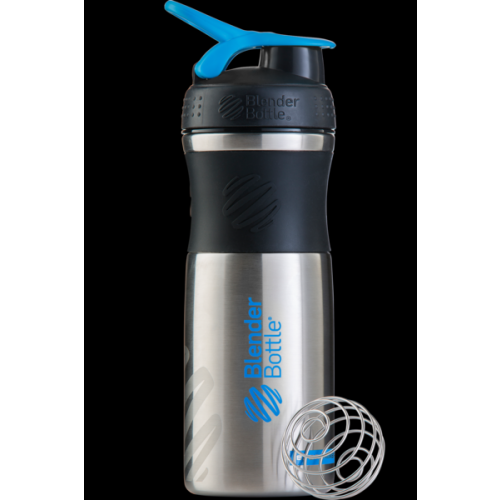 BUY NOW BlenderBottle - SUPERIOR STRENGTH SUPERIOR STRENGTH Made from high-quality, impact-resistant steel, the SportMixer® is the ideal companion for any on-the-go lifestyle. BlenderBottle - CLIP IT, LOOP IT, HANG IT CLIP IT, LOOP IT, HANG IT The versatile SportLoop™ lets you easily clip your SportMixer® to your gym bag or backpack to take anywhere. BlenderBottle - GRAB A HOLD GRAB A HOLD The SportGrip™ offers a firm hold, whether you’re shaking up some protein, or carrying water during your jog.